Plain concrete pavements are subject to premature cracking due to the formation of residual stresses, structural confinement, and loss of subgrade support. These factors diminish the loading capacity of pavements and can result in cracking when combined with stresses attributable to curling and wheel loads. 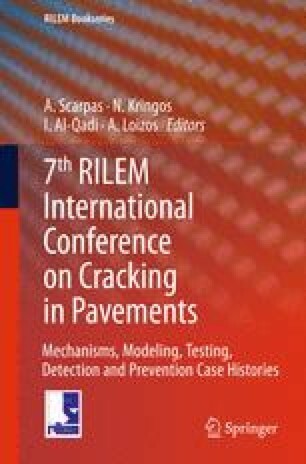 It is, thus, advantageous to quantify the unloaded stress state of pavements in order to modify its rated capacity and prevent premature cracking that, in some cases, necessitates costly repair or replacement. A research program was developed to craft a new field testing procedure capable of measuring the stress state in cantilevered concrete beams and in-situ slabs. The experimental results of this testing procedure showed that the stress state at the concrete surface could be fully quantified. Finite element modelling of the concrete beams and in-situ slabs further corroborates that the surface stresses in pavements can be viably measured.